The Mega64 crew has announced the release of their DVD set, "Mega64: Version 1 Special Edition!" This 2 upcoming 2 Disc Set is the first season of the public access show you came to love (or hate) from way back when, remastered with a slew of new surprises! This re-release includes: -All five original half hour public access episodes, documentary, and other stuff from the original Version 1 DVD! -New episode intros! -Original 2003 Commentary and NEW "Five Years Later" Anniversary Commentary! What does the Mega64 crew think of these episodes five years later? Can you hear them cringing? -The infamous LOST EPISODE! An entire half hour episode from Version 1 that was so bad it didn't even make the original season cut. It's that bad. -Perhaps some other dope surprises to be announced! This 2 Disc trip back to Mega64's past will be released this Thanksgiving weekend, on Black Friday! Forget lining up at Best Buy at 4am for cheap surge protectors- The REAL gift this holiday season will be on sale at Mega64.com! Look for more news, shots of the special new cover art, and other scoopage on this release soon! Today we also have a new podcast for you, but viewer beware, you're in for a scare! This Mega64 Podcast Halloween Special "SPOOKCAST" may be the most horrifying podcast the internet has ever seen! Watch as a rogue gallery of ghouls talks about Little Big Planet, Dead Space, Rock Band 2, and the big DVD announcement! Watch below or subscribe to the left. The audio version is here. A quick note: A lot of people have asked us why audio podcasts haven't been showing up in iTunes and whatnot lately. 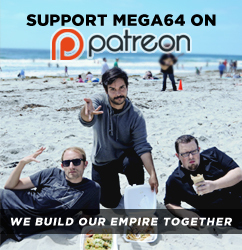 It's because we're still working out the bugs with the new Mega64.com and for some reason, the audio version just isn't syncing up like it should be just yet. We encourage you to come back and get that version here for the next week or so while we get things in order. Thanks for your patience! Honestly, the audio people would hate this week's episode anyway. Maybe we did you a favor? We'll be back soon with more fun news. Happy Halloween!